The Middle Reaches of Russian River along Westside Rd. But of course, why go anywhere to do one thing? I took this to be as good a time as any to also catch up on some Russian River Valley vignerons. Pinot lovers, remember the Russian River? 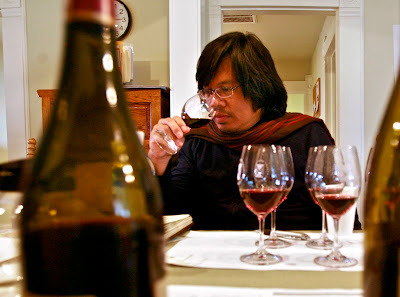 Yeah, yeah, we’re all enthralled by the seemingly ethereal wines from the so-called “true” Sonoma Coast (enjoyed a fabulously deep ’07 Fort Ross Pinot Noir at Carneros Bistro last Wednesday night, as a matter of fact). Sta. 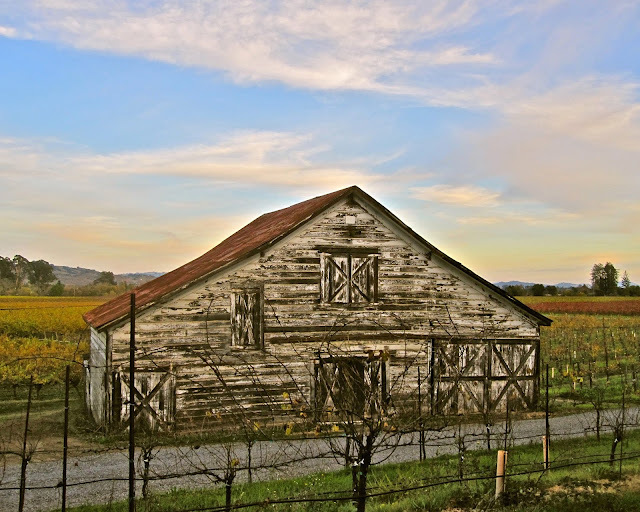 Rita Hills and the Willamette and Santa Maria Valleys can all lay claim to be pinot’s “promised land,” and the new fangled noirs from Santa Lucia Highlands and Marin are definitely turning our heads. But like the black haired, slightly slanted dark eyed beauties in the long, leathered black gloves André Tchelistcheff used to always talk about, the pinots of the Russian River Valley continue to grow on us, even as her face is filled out by encroaching maturity, the curves rounding with increasing tenderness, the eyes more knowing, the scent more intoxicating, and the lips more scarlet, more Johannsonish than Johannson… the gold standards of American pinot noir are not so much back, they’ve never really left us, haven’t they? The following are notes on what I consider my favorites (I’d sooner “rate” wines higher or lower than I would my four kids and three grandkids), based upon some winery stops, but mostly upon an extensive tasting of twenty-five pinot noirs assembled in the office of the Russian River Valley Winegrowers by Marketing Manager Lee Hodo (thanks a grape bunch, Lee!). 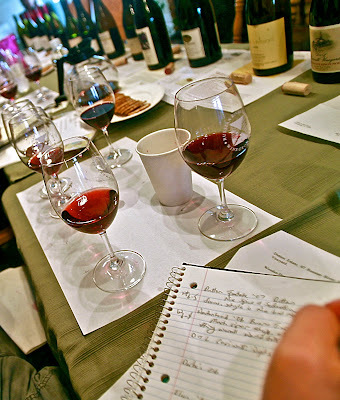 Although the bottles in the RRVW tasting were laid out for me to see, I deliberately averted my eyes to taste without knowing exactly which pinot was what. Sitting down with me were Eric Luse, owner/winemaker of Eric Ross Winery (also a professional photographer, re the photo to the right); Mike Sullivan, winemaker/partner of Benovia; and John Suacci, proprietor/grower of Suacci Carciere Wines. 2007 Baker Lane, Ramondo Vineyard Sonoma Coast Pinot Noir – By listing this first, I’m not saying this is the greatest thing since Bob Marley. I’m just saying it happens to epitomize what I love most in pinot: a purity of fruit and terroir (as opposed to oak or other manipulations), and extreme delicacy (so I love waifish femininity, what of it?). Owner/grower Stephen Singer, and his winemaker Steven Canter, grow biodynamically, subscribe to natural yeast fermentation, and age strictly in puncheons (more neutral, double-plus sized barrels) to achieve their minimal interventionist ends; which here, is a lusciously sweet, focused, penetrating, strawberry jammin’ perfume, a silken fine, twiggy, low slung, swaying curvaceousness, and sumptuous pinot expression enunciated with a tart edged tongue. A preview of the ’08 from the same vineyard revealed the same, but with even more feelin’ (the yield from Ramondo down to 8 tons, compared to 12 in ’07). N.B. 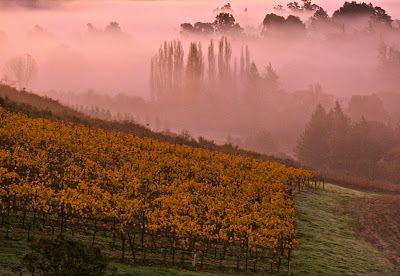 : although the label says Sonoma Coast, the vineyard (which sits across Baker Lane, just outside Sebastopol, from Singer’s home estate; the latter planted exclusively to syrah and viognier) is technically in the Russian River Valley in a subsection of the AVA often identified as Laguna de Santa Rosa; however, it’s the foggy, maritime chill of Baker Lane’s microclimate that prompts Singer to exercise the option of utilizing the overlapping Sonoma Coast moniker for this bottling. 2007 Dutton Goldfield, Dutton Ranch/Freestone Hill Russian River Valley Pinot Noir – For partner/winemaker Dan Goldfield, the hits just keep on comin’. Freestone Hill lies in a frigid pocket apart from the rest of the Dutton plantings straddling the western edge of the Russian River AVA. During a harrowing, breakneck drive-by last spring, Goldfield talked about a Freestone spice, muttering pinot imagery like star anise and caraway the way Dylan raps free-form in Subterranean Homesick Blues. In my notes, I jotted down a more vaguely defined (but distinctive) smoky spice, along with phraseology like concentrated super-strawberry and ultra-raspberry a flavorist would like, tacked in velvet upholstering, and a sweet rush of round and juicy fruit followed by a tight finish wrapped in corded tannin. When it comes to pinots like this, as the bard himself said, youdon’tneedaweathermantoknowwhichwaythewindblows. 2007 Roessler, Widdoes Vineyard Russian River Valley Pinot Noir – Of all of Roessler’s yearly pinot gems (I’m also partial to Roessler’s La Brisa and Ollie & Hazel’s Block bottlings), the Widdoes probably exudes the most Russian River Valley opulence: the finely delineated fragrances – of cinnamon stick spiced cherry, wild red berries and cola/cocoa seams – wafting from the glass and penetrating the nostrils, stunning the palate with a combination of enthralling fruitiness and silken fine texturing; powered further by crisp acidity and round, thickening tannin, lending a spectacular kick to the fruit intensity, deep into the compelling finish. From a Green Valley vineyard positioned in the cool corridor between Graton and Occidental; owned by Shirley and Don Widdoes, and planted in the early ‘90s (and still farmed) by the Dutton family. 2007 Williams Selyem, Russian River Valley Pinot Noir – Honestly, I try hard not to be impressed by modern day Williams Selyems, given the difficulty of obtaining them for most of us peons (yes, you must be on the WS List). But a spade is a spade; and in the world of pinot poker, the queen of spades trumps all: in the ’07, a nose billowing with sweetly concentrated, liqueurish strawberry/raspberryish perfumes garnished with pepperminty spice and wisps of tobacco-smoke; and on the buds, the intense fruit riding on silken fine, yet improbably sinewy and snappy, sensations, energizing the pinot fruit qualities through a long, palate freshening finish. 2007 Suacci Carciere, Suacci Vineyard Russian River Valley Pinot Noir – LIke Baker Lane and Dutton’s Freestone, Suacci is couched in the coolest, southernmost reaches of the AVA, in a sparsely planted region that has become known as Sebastopol Hills (also, Blucher Valley), incorporated into the Russian River Valley AVA only in 2005. In any case, this vineyard seems to whip up dreamy pinot fruit with grace and ease: sweet strawberry notes with sprigs of wild mint and smoke of oak and cooking spices (I found cardamom and cumin, but I could’ve been hallucinating). A soft, velvety entry gives way to rounded tannin and zippy acidity in the middle, not an impediment to the red berry flavors surging fluidly across the palate towards a lush, almost sweet finish. 2008 Dutcher Crossing, Maboroshi Vineyard Russian River Valley Pinot Noir – Speaking of hallucinogenics, the Maborishi (Japanese for “extraordinary vision”) has recently become a magical name for pinot devotees; nestled, as it is, in Sebastopol Hills on a 400-600 ft. elevation hillside that clears fairly quickly of the dense fog rolling daily up through the Petaluma Gap. I’ve yet to taste a pinot from this vineyard that wasn’t at least a little extraordinarie. The fact that Dutcher Crossing actually specializes in Dry Creek Valley zins and cabernets, yet still can conjure up small quantities of pillowy pinots as a divergence is almost proof of that. Leading off with fraise-like wild strawberry perfumes unfettered by bombastic oak, the luscious, sweet berry flavors seem to hone in on the palate with unerringly harmonious intensity – think Captain Kirk and company, setting their low-amperage electrical guns on stun – penetrating clear through a wall of sturdy tannin and medium weighted body, the deep pinot flavors flowing through the clean cut crevice. End result: I’m told that Dutcher Crossing’s winemaker, Kerry Damskey, describes this wine as “so soft and fine you want to crawl into the glass.” Beam me up! 2008 Eric Ross, Saralee’s Vineyard Russian River Valley Pinot Noir – Standing on a neighboring knoll last week, I felt compelled to snap a shot of the postcard pretty Saralee’s (275 acres farmed by Rich and Saralee Kunde, scions of the Sonoma Valley Kundes), located on the edge of the more climatically moderate “Middle Reach” of the Russian River AVA, west of Fulton, north of River Road off Slusser (adjacent to Sonoma Cutrer and Russian Hill Estate). The rounder, riper, plumper styles of Russian River pinot have always been associated with this area; which of course, is fine and dandy with most pinophiles who’ve cut their teeth on Russian River styles of the past (who’s going to turn down a Rochioli, a Westside Williams Selyem, or an old school Joseph Swan or Dehlinger?). Ross’s is floral and flush with wild berry fruit (suggesting perky raspberry and brown spiced cranberry) laced with Christmas candy (or peppermint canes). The plush flavors gravitate to the wine’s soft, round center, giving a fleshy textured feel, the fruit driven sensations mingling with soft pedaled smoky oak in an easy finish. 2007 De Loach, Maboroshi Vineyard Russian River Valley Pinot Noir – In case word hasn’t reached you, there have been exceedingly encouraging changes at De Loach since Boisset Family Estates took over the properties in 2005 (the De Loach family setting up camp across Olivet Lane at Hook & Ladder): much of the vineyards replanted and converted to Biodynamic™ farming, and the focus placed squarely on pinot noir, in line with the family’s Burgundian lineage (the most notable of their pinot focused French domaines include Bouchard Aîné, de la Vougeraie, and their new, ultra-exclusive JCB label). Stellar pinot specialist Greg La Follette (of Tandem) has served a consulting role, although recent winemaking responsibilities have been placed primarily in the hands of Brian Maloney (coming from Balleto in ’03). While waiting for their replantings to mature, De Loach has continued to fashion a Russian River Valley OFS (a sweetly cinnamoned, meaty pinot in ’06), their Green Valley pinots have been brilliantly perfumed, and their Sonoma Stage Vineyard cuvée from Sonoma Coast a lovely essence of pinot spice (incense and peppermint); but it is their Maboroshi bottlings that have been raising the most eyebrows: in ’07, positively lip smacking, plush and plump with strawberry scented pinot qualities tinged with allspice, the brightly fruit driven mouth-feel negotiated through a crisp, deftly balanced length of medium body. 2006 Russian Hill, Leras Vineyard Russian River Valley Pinot Noir – On Russian Hill’s knoll near the east bank of the river before it starts to wind westward towards Guerneville, the coastal fog banks creep in through both the river and up from the Petaluma Gap well to the south. Hence, diurnal swings are tilted more towards ample sun, producing a pinot of ample fruitiness, fat with wild blackberry and cherry fragrances, tinged with peppermint tea spices mixed with toasted nut tones, amplified further by a smack of smoky oak. On the palate, it follows as a nice, fat Middle Reach style of Russian River pinot; the fruit sweet and delectable, unfettered by firming tannin. 2007 Benovia, Bella Una Russian River Valley Pinot Noir – Winemaker/partner Mike Sullivan’s extensive prior experience with Russian River pinot includes Hartford Court’s glory days (late ‘90s, early 2000s), and his Bella Una is an artful blend of fruit from the slightly warmer Middle Reach, the fairly cool climate Green Valley, and the even cooler climate Laguna de Santa Rosa subsections of the Russian River Valley; as it were, mixing plump, juicy black and red berries with cherry fragrances and smoky oak nuances, manifested as soft, lush flavors supported by round tannins. Structurally finesseful, yet simultaneously warm and friendly. 2007 Sequana, Dutton Ranch Green Valley of Russian River Valley Pinot Noir – The Dutton farmed properties in Green Valley give a pliant, orbular, balanced style of pinot noir; and in the hands of winemaker James MacPhail (who also makes bang-up Sonoma Coast and Anderson Valley pinots under his MacPhail Family label), the fruit is bright, sweetly scented (strawberry/cranberry), yet grounded on a proportionate base of sturdy tannin and wiry acidity. 2007 Gary Farrell, Russian River Valley Pinot Noir – Multi-vineyard sourced, this is something of a crafty expression of the Russian River Valley pinot profile of olde (at least in my book): transparent ruby red; more aggressively oaked varietal qualities of smoky spice, red berry and black plum perfumes; and a medium-full body, somewhat broad and seductively sculpted by the soft, scented fruit textured with reams of oak and unobtrusive tannin. 2007 Moshin, Lot 4 Selection Russian River Valley Pinot Noir – One of things I’ve been most pleased about recent tastings of Russian River pinots is the apparent moderation of oak; as if there is less compulsion to please certain critics obviously swayed by those qualities (I think it was Kermit Lynch who once related the obsession with oak with men who like really large breasts). Whether this has to do with unconsciously maturing skills, an industry trend, or the attitude that critics and scores are mattering less and less, it doesn’t matter: I like it; and if you do, too – cool. Moshin’s Lot 4 skirts the edge between the recent fruit focus and sweetly vanillin, toasty, smoky oak embellishments more common than not in Russian River pinots of the previous millennium. The oak char is distinct, but supportive of exuberant cherry/berry qualities; thickening the tannin laced medium-full body somewhat, yet allowing the wine to finish round and pinot-ish. 2007 Picket Fence, Russian River Valley Pinot Noir – Here the smoky oak is more prevalent, yet harmonized with a lush generosity of red berry perfume; the pinot fruit qualities plopping on the palate with a silk shrouded gushiness, before firm tannins tighten the middle and wrap around the sweet fruitiness. Sourced from the winery’s Green Valley Vineyard. 2006 Derbès, Russian River Valley Pinot Noir – The product of Champagne, France born winemaker/proprietor Cécile Lemerle-Derbès, this a chubby style of pinot, brimming with strawberry, cherry and licorice spice, with smidgens of toasted oak and burnt leaf peeking out from underneath. Tannin is moderate, so the bright fruit is allowed to brim over the palate, finishing long, lush and easy. The gold standards of American pinot noir are not so much back, they’ve never really left us, haven’t they? I can't give you an exact answer... But this custom essay writing service will do some research on the chosen topic of our uncompleted discussion!